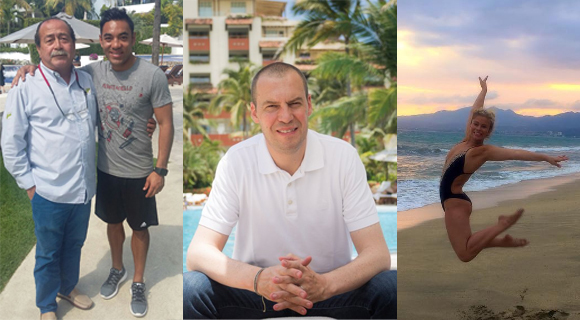 American UFC fighter Paige VanZant, Mexican soccer player Marco Fabián and Mexican sportscaster André Marín enjoyed some R&R in the Riviera Nayarit. The Riviera Nayarit Convention and Visitors Bureau’s Celebrity Watch detected a few sports celebrities who were enjoying themselves in Mexico’s Pacific Treasure last weekend. Paige VanZant, the American mixed martial arts fighter who is currently competing in the women’s strawweight category in the Ultimate Fighting Championship (UFC), was completely enamored of her visit to Villa La Estancia in Flamingos. Mexican soccer star Marco Fabián, who rules Germany’s Eintracht Frankfurt team, visited La Cruz de Huanacaxtle and stayed in the luxury villas of Vallarta Gardens. Jesús Carmona, the development’s director of operations, took care of the soccer player himself during his nearly weeklong stay in the Destination. Mexican Fox Sports commentator André Marín hosted an event at the Grand Velas Riviera Nayarit in Nuevo Vallarta during the transmission of the Mexico vs. Chile game. The host of La Última Palabra (The Last Word) sports show aired his commentary for hotel guests during the quarterfinals of the 2016 Centennial Copa América.